Amano with senior Enec officials at the nuclear plant site. The progress being made by the UAE in developing its nuclear energy programme has been hailed by the International Atomic Energy Agency (IAEA) director general Yukiya Amano during a visit to the Barakah Nuclear Power Plant (NPP) site in the Western Region of Abu Dhabi. The visit was hosted by the Emirates Nuclear Energy Corporation (Enec). The visit served as an important opportunity for the director general to observe the significant progress being made at Barakah, which is now the world’s leading nuclear energy construction site with four identical reactors being safely constructed simultaneously. During the visit, which was also attended by the UAE’s permanent representative to the IAEA, Ambassador Hamad Al Kaabi, Enec’s chief executive officer Mohamed Al Hammadi outlined some of the recent major construction milestones achieved on site and discussed the organisation’s commitment to continue sharing best practices, knowledge, and lessons learned with the agency and the international nuclear community as it completes construction and prepares for operations. 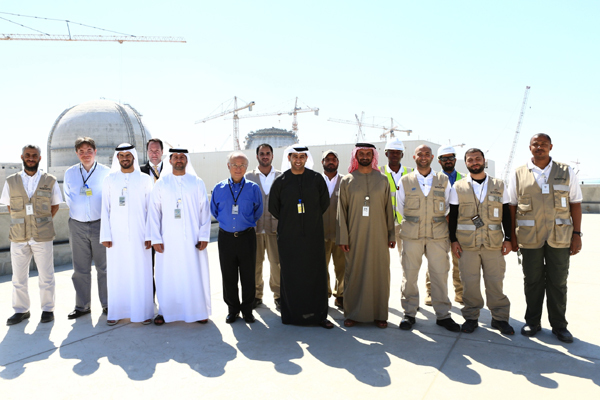 Amano congratulated Enec and all of its staff for the progress made since his last visit in 2013. “The UAE continues to make excellent progress in the development of its nuclear energy programme and we would like to commend the UAE government, Enec and FANR (Federal Authority for Nuclear Regulation) for their clear commitment on safety and to delivering a world-class industry and facility here at Barakah,” said Amano. Unit One of the project is now more than 85 per cent complete and Unit Two is 65 per cent complete. Overall, construction of Units One to four is now more than 58 per cent complete. All four units will deliver safe, clean, reliable and efficient nuclear energy to the UAE grid by 2020, pending regulatory reviews and licensing.